I first was introduced to this ground breaking new outreach book as a college student. It's launch in 2017 brings back memories. There were not too many publications available addressing issue about the authenticity of the bible. Especially in college, many student' found their faith challenged and the bible the credibility of the bible was questioned within the classroom by professors and outside the classroom by peers. This book was revolutionary in that it gave credibility to the area of apologetics. It armed bible believing Christians with facts as well as the tools needed to defend one's faith. For many college students this book was a lifesaver. This book is an extensive reference book. It would be suitable for an apologetics course as well. This book takes time to read and assimilate the information presented. There is a lot of supportive evidence provided. The book is divided topically so that the reader may skip around rather than read cover to cover. Lastly the gospel message is presented based on vintage bible study tracts. This is important as the authors point out that the message of salvation is more important than simply winning a debate. This book is a must have for anyone who wishes to have the tools needed to defend their faith. Not only that, this book is the perfect outreach opportunity for skeptics providing common sense, factual support in a systematic and comprehensive format, with sufficient detail and evidence to satisfy even the most stead fast opponent. This book is the perfect springboard to share your beliefs with others. This book could not have been published at a better time. If you are a skeptic and find yourself with questions, this will be a lifechanging book. As a blogger I received a copy of this book for the purpose of writing this review. 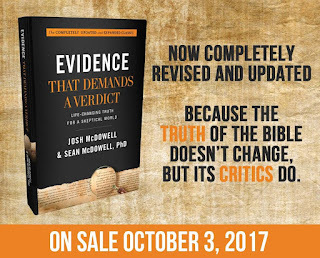 Pre-Order Evidence That Demands a Verdict and download two chapters, “The Martyrdom of the Apostles” and “The Historical Existence of Jesus,” immediately! Use the link bit.ly/OrderEvidence to take advantage of this bonus offer. 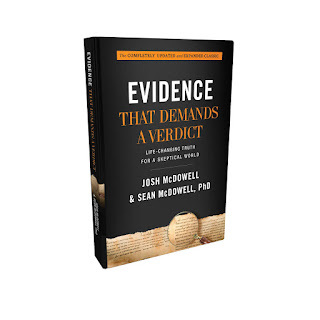 Evidence That Demands a Verdict, the modern apologetics classic that guided millions to defend their faith, is NOW completely revised and updated—because the truth of the Bible doesn’t change, but its critics do. The modern apologetics classic that started it all is now completely revised and updated—because the truth of the Bible doesn’t change, but its critics do. 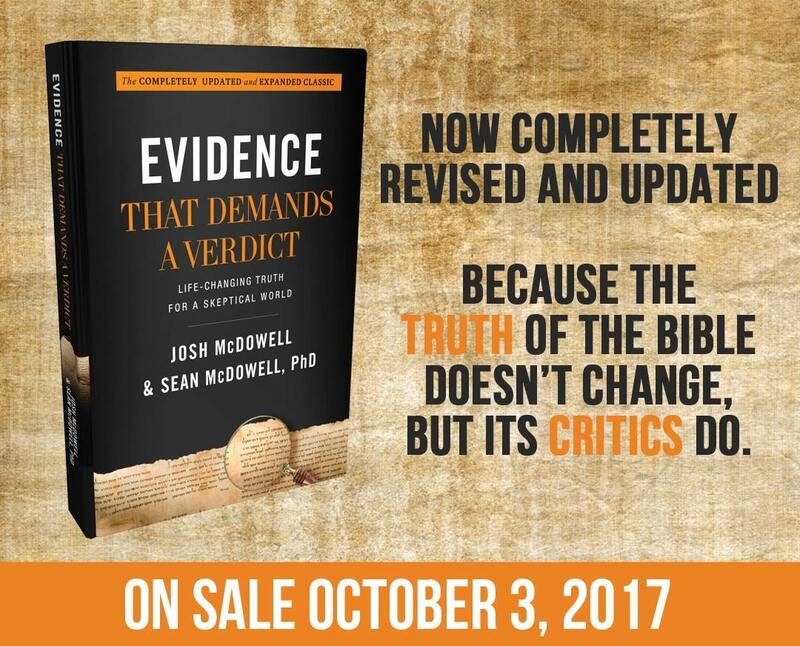 With the original Evidence That Demands a Verdict, bestselling author Josh McDowell gave Christian readers the answers they needed to defend their faith against the harshest critics and skeptics. Since that time, Evidence has remained a trusted resource for believers young and old. Bringing historical documentation and the best modern scholarship to bear on the trustworthiness of the Bible and its teachings, this extensive volume has encouraged and strengthened millions. Now, with his son Sean McDowell, Josh McDowell has updated and expanded this classic resource for a new generation. This is a book that invites readers to bring their doubts and doesn’t shy away from the tough questions.